The PSI Science Lamp contains a laboratory grade Random Number Generator (RNG) that provides a fun way to investigate the Mind-Matter interaction detailed in parapsychology journals and peer reviewed papers. Use the Second Sight Light to test for psychokinesis (PK), precognitive and telepathy. Does the human mind have the capability to influence the physical world? To answer this question scientists have tested subjects trying to influence the output of a Random Number Generator using just their mind. Most of the elite group of scientists who are brave enough to investigate PSI phenomena over the ridicule of established scientific community have reported positive results. Peer reviewed scientific papers published over the last 20 years confirm the mind's ability to influence machines and probability at the quantum level. Our PSI Science Lamp incorporates a laboratory quality random number generator that allows you to perform your own psychokinesis, PSI and ExtraSensory Perception (ESP) experiments. The random output of the generator lights one of four LED colors. This simple four color output makes it easy to statistically test and check the Mind to Matter interaction of Psychokinesis and ESP ability. Use the online Probability checker to check your results to see if you have detected any PK or PSI abilities. Precognition: Predict the color of the LED that will light next and track the results. Psychokinesis (PK): Use your mind to influence and color output from the light. Telepathy: Two people in separate rooms, one is a sender the other a receiver. 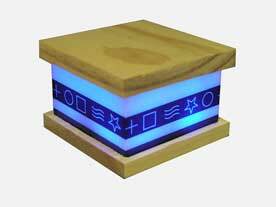 The sender observes the PSI SCience Lamp, and tries to transmit the color changes when they occur, to the receiver. Fortune Telling: Use the random color generated to indicate answers to questions. Radioactive Fallout Detector: Since the PSI Science Lamp 02 has a built in Geiger counter, excessive radiation, from say radioactive fallout, would cause the LEDs to blink rapidly. Each random number generated will light one of four different color LED's; red, green, blue and yellow. True random numbers may be used to accurately test for different aspects of ESP.